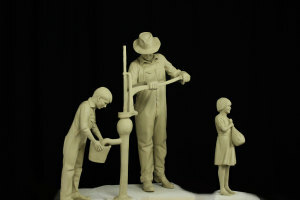 The Windsor-Severance Historical Society has started “Fulfill our WiSH” (Windsor Severance History), a $150,000 campaign effort to commission a 9-foot bronze monument that will depict the sugar beet, water and work history of the local area. 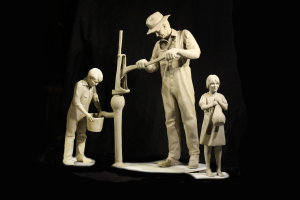 The sculptor on the project is 25-year-old Loveland resident Austin Weishel (Click here to see his website), whose sculpture “Follow Your Heart” is currently housed in front of the Windsor Fire Department on 7th Street. Weishel, who is also a volunteer firefighter, combines his passion for both art and firefighting in many of his works including this commission for WSHS, which will delve into history capturing the daily chore of getting water. Now in their 26th year as an organized nonprofit, WSHS is kicking off this campaign to coincide with the town of Windsor’s 125th anniversary in 2015. Help us Fulfill our WiSH and make this wonderful art and history contribution to our town a reality! Your gift of $25, $50, $100, $500, $1,000 or $5,000 or more can make it happen. To make your contribution to the “Fulfill our WiSH” campaign, please call Marge Straube, campaign chair, at 970.686.2624 or donate via paypal here! We process our donations through PayPal for secure transactions.